And... Have Your Black Belt Awarded to You in Japan?! Here's your chance to become an Uchi-Deshi "Live-in Student"
The term uchi-deshi is Japanese for "live-in student(s). Traditionally, these were students who lived with, trained under, and learned more than martial arts skills from a true master of budo. ...for the sole purpose of immersing themselves in their training. Work on special projects and work that develops the proper mindset of "giving for the benefit of others"
A student who joins in an uchideshi program lives at a dojo, not only to train in the physical and combat aspects of budo, but every part of his or her daily life becomes part of the training as well. Traditionally in Japan, this kind of training in the martial arts has been available only to those students who were earnest about dedicating their time for serious practice. The uchi-deshi program at Warrior Concepts International allows serious students to live and train "in-house" without all of the day-to-day issues that serve to distract the part-time student. Students train every day in the strategic, philosophical, spiritual, and... yes... physical aspects of our traditions. Training is done with both senior black belt teachers and with Miller Sensei. You'll also Learn how to be a teacher of the martial arts and the principles and lessons needed to run a successful dojo. A Full Program But, Is It For You? The Warrior Concepts Uchi-Deshi Program is a full, Black Belt Instructor Training Program. But, it's not for everyone. Uchi-deshi students are expected to learn to prioritize their lives. Students applying for an Uchi-Deshi position in the dojo should consider the decision carefully. His or her priorities will not be the same as most people they train with, know or come in contact with. The dedication to the training, dojo and the other students must be paramount. Again, enrolling in the uchi-deshi program is not a way to run away from society or oneself. Each deshi must be capable of completing his or her training without becoming a hindrance to the dojo, the sensei, or the fellow deshi. Uchi-deshi train about 6 times more than regular students, and the program literally condenses three to five years of regular training into a single year! So... as you can see, a positive attitude is required to be a successful uchideshi. Sensei Miller personally reviews and approves all placements. The following requirements must be met by each applicant in order to be considered for a place in our program. NO EXCEPTIONS! No record of psychological illness, drug abuse, or criminal activity. Minimum education - high-school diploma (or native country equivalent) required. At Warrior Concepts, we value and appreciate the fact that all members reflect a great level of diversity. As a result, all members are expected to respect these differences and not act in any manner which might cause discomfort or offense to other members. Warrior Concepts and Sensei Miller reserve the right to refuse anyone from participating at the dojo in the interest of safety and the welfare of other students and regular members. and an intense, exclusive, training opportunity that isn't available to any but the most serious student! The full 1 year program is valued at over $101,600.00 US! It's included as a part of your 1 year Uchi Deshi Program! A $5,000.00US ($1,500 per trimester) deposit is required to hold your place with the remainder to be paid (in-full) by the start date of your session. You will be getting 3-5 years of training in just ONE YEAR! ALL lodging, utilities, and meals are INCLUDED. REMEMBER: Enrolling in the WCI Uchi-Deshi Program is easy. Staying committed, on-track, and not quitting is up to you! PLEASE NOTE: There are no refunds given for early withdrawal or dismissal from the program. *If withdrawal is for health or family crisis reasons, credit toward future training will be considered on a case-by-case basis. 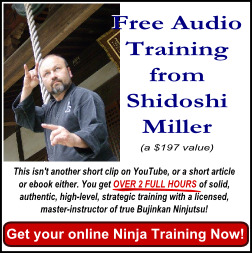 Neither Warrior Concepts International, nor Sensei Miller acts as a sponsor for visa applications. Uchi-deshi applicants must obtain their own visas (if required) for their intended stay in the United States. All uchi-deshi at WCI must be in full legal status with US Immigration regulations. Contact Shidoshi Miller for Dates! The program is limited to no more than ten (10) uchi-deshi at any one time. This includes full year and trimester deshi. If you are applying for a semester, you must check to see if we have a vacancy during the time you are considering. It's a good idea to have a 2nd and 3rd choice available for your stay with us, should your first choice not be available. Please send a letter of request to enter the program that includes a personal resumé, starting dates, tentative length of stay, and a brief explanation of why you wish to enter the program. A photo is requested for our files. Your letter will be responded to promptly. Once we receive your application/resume, and you are approved, you will receive additional information that you will need for your stay. Personal life and relationships must be only on the "weekend" days when the dojo closes. Personal life partners may not stay over at the Deshi living quarters. Visits must be kept chaste. You will receive scheduled weekend, holiday, and/or personal time each month when you may return home to visit family, etc.